The city of Medan on the North-East of the island of Sumatra in Indonesia has a growing Christian community. With the increasing congregations the churches are looking to expand both their places of worship and also the place of music within their worship. The newly formed Grha Methodist church is one such church and with a new building came a new organ to lead their congregation. The design of the building included a shallow apse and the architects needed the organ to fit within the apse, on either side of the cross. MPOS was asked to propose a design to suit this space and suggested two cases with gentle curves which gradually diverge from the apse wall before cutting back sharply to frame either side of the cross. The church liked the design and MPOS was then asked to complete a detailed design and make the organ a reality. 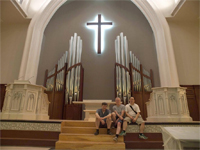 In 2011 MPOS, with David Wilson and CJ Lim (of Sonata Music in Singapore), completed the installation and tonal finishing within the finished church. The case contains all the speakers and pipes (and associated parts) of the organ, with the 1 6' Pedal Principal providing a striking frame to the cross. As the only known instrument in Sumatra with speaking pipes this new organ will help provide the people of Medan the opportunity to sing with, and explore the music of, a previously largely unknown instrument.